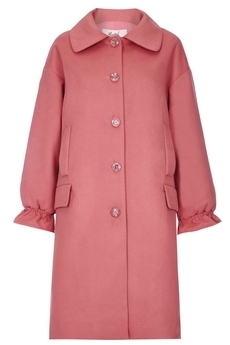 Yumi London, Collar and Ruffle Cuffs coat is designed for a relaxed silhouette, made from butter-soft fabric and features a button placket down the centre, front pockets, elasticated flared cuffs and collar neckline. It is fully lined and is approx. 95cm in length. Winter collection. Composition: 100% Polyester. Color: Cinnamon.